A visit from Pekin’s Ghost of Christmas Past . . . This is a reprint of a “From the Local History Room” column that first appeared in Dec. 2011 before the launch of this weblog. If you’ve ever wondered what Christmas celebrations were like in Pekin way back when, an old handbill from 1879 in the Pekin Public Library’s Local History Room Collection can be a way to summon a visit from Pekin’s Ghost of Christmas Past. 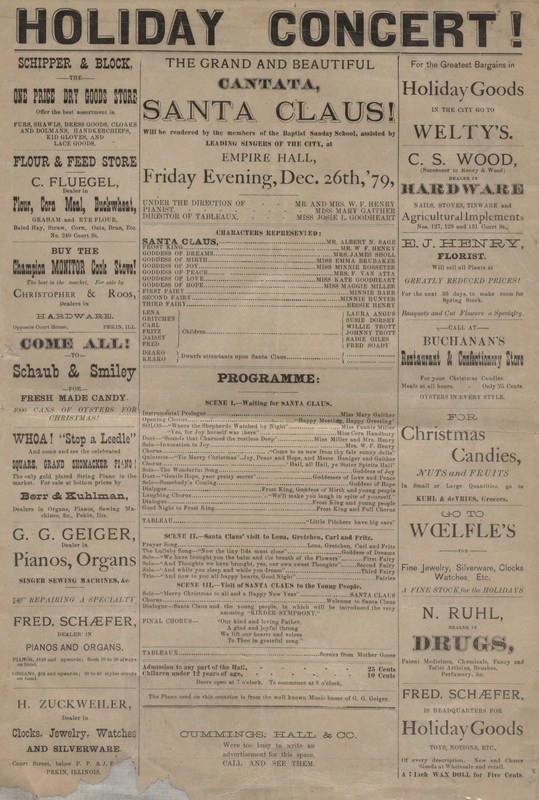 In large, bold letters, the handbill announces a “holiday concert” to be presented Friday evening, Dec. 26, 1879, at Empire Hall, one of Pekin’s earliest theaters or concert halls. Empire Hall was on the second floor of a building in the 200 block of Court Street – so that should give you an idea of just how long Pekin has been celebrating Christmas downtown. This 1879 handbill, donated to the Pekin Public Library by late local historian Fred W. Soady Jr. and now displayed in the library’s Local History Room, opens a window on Pekin’s Christmas traditions of long ago. The holiday concert was a three-scene Christmas cantata entitled, “Santa Claus!” which was performed “by the members of the Baptist Sunday School, assisted by LEADING SINGERS OF THE CITY,” as the handbill states. Directing the cantata were Mrs. and Mrs. W. F. Henry, while Miss Josie Goodheart directed two silent tableaux vivants that were presented at the end of the first scene and at the conclusion of the cantata. The price of admission was 25 cents for adults and teens, and 10 cents for children under 12. Lining both sides of the handbill are advertisements by the local merchants who sponsored the cantata, offering “the greatest bargains in holiday goods in the city,” “Christmas candies, nuts and fruits,” “holiday goods, toys, notions, etc.” In that respect, Christmas in 1879 wasn’t any different from Christmas today. Also advertised are “1000 cans of oysters for Christmas!” and “oysters in every style.” Though they a part of a traditional Christmas dinner – for Christians used to abstain from meat during the penitential season of Advent, and so Christmas Eve dinners would feature seafood – oysters are probably not as popular these days as ham or turkey. Much about the cantata also would be familiar to us today, but other things would be a little strange. The cantata tells the story of six children waiting for Santa Claus on Christmas Eve, but the handbill says nothing of Santa’s reindeer, who made their first appearance in Clement Clarke Moore’s famous 1823 poem, “A Visit from St. Nicholas” (better known as, “Twas the Night Before Christmas”). Also absent from the cantata were Santa’s elves and the toy workshop at the North Pole, which are later developments of the Santa Claus story. Instead, the audience was treated to a character called the Frost King, as well as three Christmas fairies and Santa’s two attendants, dwarfs named Drako and Krako. Also prominent in the cantata were six goddesses, representing Dreams, Mirth, Joy, Peace, Love and Hope. It was the task of the Goddess of Dreams, played by Mrs. James Sholl, to sing a lullaby, “Now the tiny lids must close,” to ensure the six children were fast asleep before Santa’s arrival. 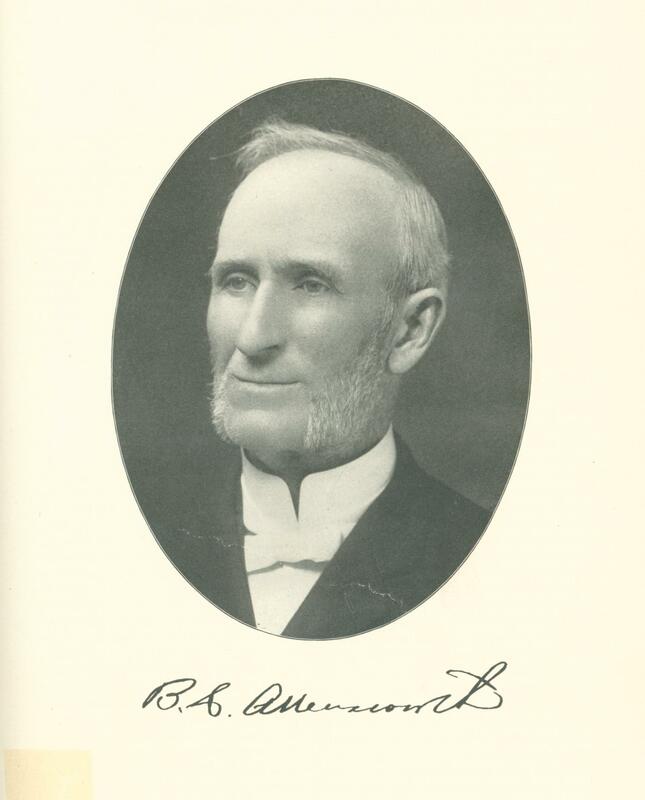 A final bit of local history trivia: playing one of the children in the cantata was Fred W. Soady Sr., born Sept. 5, 1867, whose biography appears in the 1894 “Portrait and Biographical Record of Tazewell and Mason Counties,” page 696. Some past “From the Local History Room” columns have featured quotes from a 1960 paper of Pekin’s early history written by Fred W. Soady Jr., grandson of the child actor of 1879. 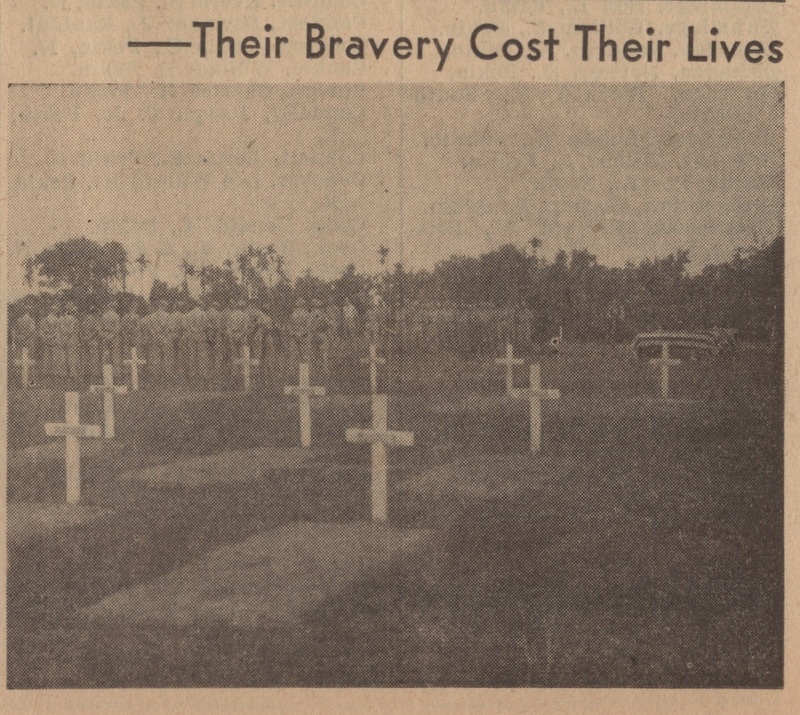 This is a reprint of a “From the Local History Room” column that first appeared in July 2012 before the launch of this weblog. The 1870 directory billed itself as “the first history and directory of the city.” The conjunction “and” is important – it was not the first city directory (that was the 1861 Roots directory), but it does contain the first published history of Pekin. If not for the Sellers & Bates directory, our knowledge of Pekin’s early history would be greatly impoverished. Bates was the younger half of the printing and publishing partnership of Sellers & Bates. Sellers was William W. Sellers of Pekin, a newspaper publisher and Republican politician (there was no clear line separating the two roles in those days, even as the line between journalism and politics is obscured in our day) who enjoyed a fair degree of local prominence. The entries for William Sellers and his printing firm, Sellers & Bates, in the 1870 Pekin City Directory which his business produced and published. Shown is an advertisement for the Tazewell County Republican newspaper from the 1870 Sellers & Bates Pekin City Directory. The Tazewell County Republican was owned and published by William W. Sellers. The reference to Sellers’ death in 1872 explains why Sellers’ name dropped from the title of subsequent editions of the Pekin City Directory. The business partnership of Sellers & Bates was ended by Sellers’ untimely death, after which Bates continued to publish the directories alone. The “Atlas Map of Tazewell County, Illinois” was published about 1873. 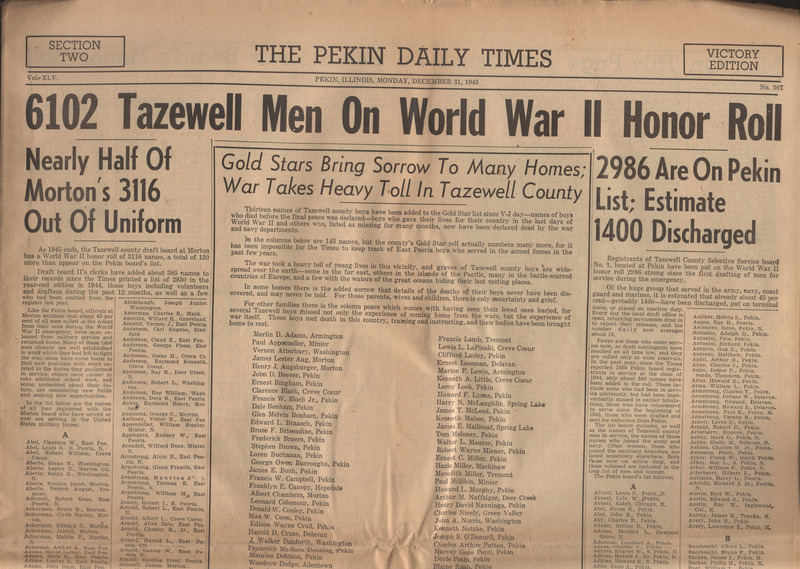 The atlas includes several lengthy biographies of the “Old Settlers of Tazewell County,” all of them laden with fulsome praise of their subjects. On page 43 is a biography of Sellers that reads more like a funeral eulogy than a proper biography, but which nevertheless records all of the highlights of his life. Sellers went into journalism in the early 1850s as assistant editor of the Chambersburg Repository, but at age 22 he moved to McConnellsville, Pa., and became the owner and publisher of the Fulton Republican. “He was married July 8, 1856, in Indianola, Iowa, to Miss Lide Smith, with whom he first became acquainted in his native town.” They had five children. After their marriage, they returned to McConnellsville, where Sellers continued to publish the Fulton Republican. He also was elected to the Pennsylvania legislature. 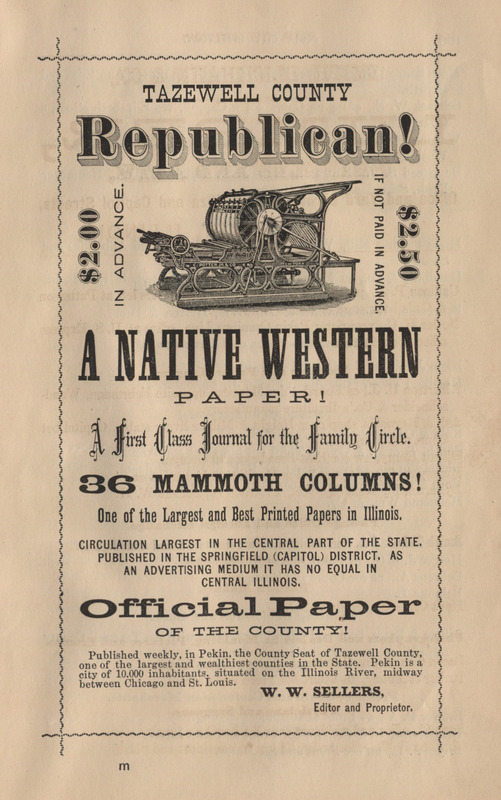 Sellers settled in Pekin in November 1863 and soon after purchased the Tazewell County Republican. “The county was largely democratic at this time, but owing to the herculean labors of this gifted journalist, we may largely account for the political revolution of 1872, when we find, for the first time in its political record, that the county was republican,” his biography says. Somewhat remarkably for that era, after Sellers’ death, President Grant appointed Sellers’ widow as “postmistress of Pekin.” “The appointment meets the approbation of the citizens of Pekin, and it is well conducted through her management,” the biography says. 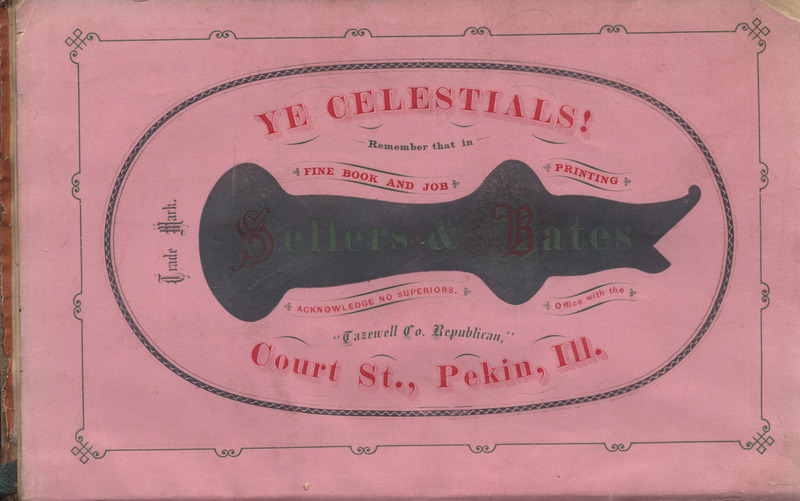 This color advertisement for Sellers & Bates Printers, a Pekin business located in an upstairs office on the south side of Court Street four doors east of Third Street, features the business trademark. Sellers & Bates produced the 1870 Pekin City Directory, in which this ad was run.